Sadly, we’ve all come across scams of sorts at some point in our lives… and it isn’t any different when it comes to Oriental Rugs. Many people have been scammed for thousands of dollars by dishonest dealers who either sell extremely over-inflated priced rugs, or rugs that aren’t the type of rug the buyer is led to believe. I was visiting Alaska a few years ago, and there was an oriental rug store among the many shops that the tourists were flocking to. As a rug fancier – and a rug dealer myself – I decided to dip in check it out. As I was looking around, I could hear the dealer telling an elderly couple that “this rug is 100% pure silk Turkish Hereke”, which is a great rug. Fortunately for the buyers, they moved on. After they left, I went to check out the rug the dealer was pitching as “100% pure silk Turkish Hereke”, and found it to be a hand-knotted Sino-Persian artificial silk rug, which is still artwork and worth something, but it’s NOT the much more valuable Turkish Silk Hereke. I asked him to tell me a little about the rug, and he repeated what he had told the other couple. I pretended to study the rug in front of him a bit, and asked “Is it from China?” and he replied “no, Turkey!”. I asked if it was pure silk, to which he replied “yes!” Then I asked “it’s not mercerized cotton?” With a baffled look on his face, he said “you’re a dealer, aren’t you?” The guy was just there on a 1 month lease, and owned a warehouse in San Francisco. He figured nobody would ever be able to find him there and being that most of them were only visiting Alaska, they wouldn’t even try. I told him what he was doing was not only flat out wrong, but also damaging to our business as a whole, and I walked out. 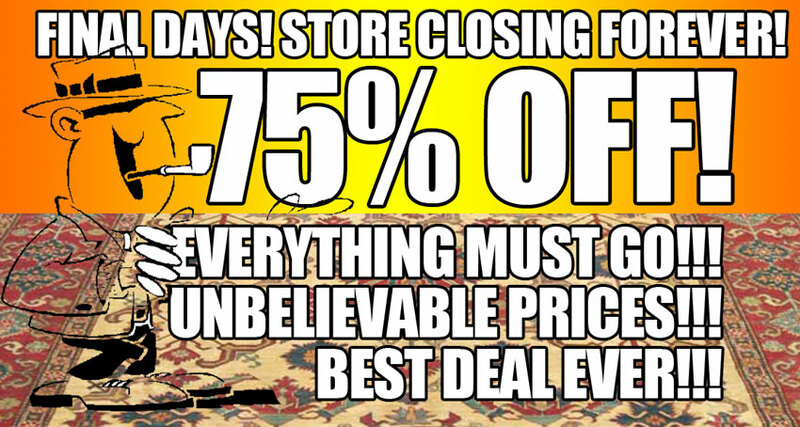 You see an ad in the paper for an Oriental Rug Store “Going Out Of Business” sale with 80% off! Wow, sounds like a good deal right? Wrong. Were these guys even in business here a year ago? Probably not. And they won’t be there 2 months from now either. Who are these guys? They are usually from out of town, traveling across the country, and they either run a “Going out of business” or “Bankruptcy” sale only weeks or months after they’ve opened, or do “Liquidation Sale” auction and other cleverly named auctions at hotel lobbies, using heavy advertising. We have seen many of these fraudulent oriental rug scams in the Tampa Bay area. While some going-out-of-business sales may be legit – when it’s a reputable business that’s been around for a while – most of them are just a way for the dealers to get rid of their overstock at very inflated prices. Even if you do get a decent rug, you’ll end up over paying for it by thousands. How does the “scam” work? The fraudulent dealer will take a rug that we – for example – would sell for $1500 and tag it with a ridiculously inflated price at $9999, and entice the buyer with a 75% off “everything must go!” pitch. So the buyer pays $2500 for the rug and thinks they are getting a great deal, only to either find out or not that they paid $1000 more than the rug was worth. If they do find out, there is usually an “all sales final” disclaimer in size 2 font on the bottom of the invoice, and eventually nobody for them to go back to. Those guys will be long gone and in some other town pulling the same scam under a different entity by then. So, long story short, do yourself a favor and purchase your rugs from reputable dealers that sell you quality pieces at their fair price, with a return policy and product support. Just like cars, there is a huge variety in quality, type, and price when it comes to handmade rugs. We’ll educate you first about these variations, and find a rug for you that best suits your needs and what you’re looking for.